Whilst looking for new ways to use up leftover Thanksgiving turkey I happened upon an old favorite of mine, the Monte Cristo. This was a sandwich that I used to love ordering in Pargos a restaurant that we frequented when I was younger growing up in Baltimore. Its been years since I had a Monte Cristo and I was interested to see that it is a not a modern invention as I had previously thought. This sandwich combination originated in the 1930's and was probably used for the same thing I am using it for, ie to get rid of leftover meats from last nights dinner. 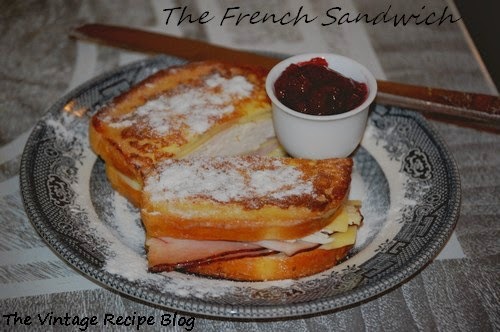 It is usually referred to as the "French Sandwich" and is erroneously attributed to being an American version of the Croque Monsieur a glorified French grilled cheese sandwich. In actuality it's called the French Sandwich because it essentially a French Toast Sandwich. This is a great sandwich for lunch or a late breakfast, but will work well any time of the day. Build your sandwich with a slice of bread, then cheese, the ham, some cheese, then turkey, finish with cheese and top with the other slice of bread. Mix Half and Half and egg in bowl well. Melt some butter in a frying pan on med heat. Dip sandwich in egg mix then flip and dip other side and fry in pan slowly, turning every so often. When cheese melts and bread is browned serve on plate. Dust sandwich with powdered sugar and serve jam on side. I used some lingonberry jam with mine and it was amazing. 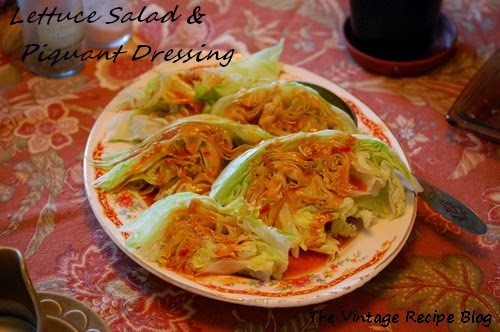 Salads as we know them today were not common back in the vintage era. Most of the time you had to use what was on hand and for a large part of the year the only lettuce to be had was iceberg. I rather like iceberg lettuce even though it has earned an undeserved maligned reputation in recent years when compared to the much vaunted Romaine Lettuce. What is important to remember is that the water content of iceberg lettuce is much higher and when that is taken into account the nutritional comparison actually evens out between the 2 contenders.